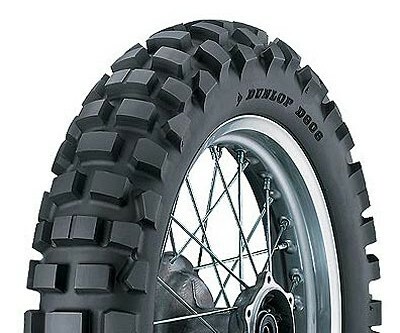 The venerable Dunlop D606 is a DOT legal desert/dual sport knobby tire touted as durable enough for dual sporting but aggressive enough for some serious off-road riding. With one caveat our experience suggests that this is all true. While perusing the web for some info on the D606 we came across one particularly interesting review on a well-know dual sport enthusiast site where a poster claimed that 606's were "SCARY" (in bold headlines) on dry pavement at any speed. Knowing Dunlop's fine track record we were skeptical of this claim and in subsequent posts it was revealed that the reviewer was running around 40 psi in each tire (and -40 in his noggin). Our own personal relationship with the D606 rear began shortly afterward. We are pleased to report that the 606 (the rear anyway) is nearly everything that it is claimed to be by Dunlop. 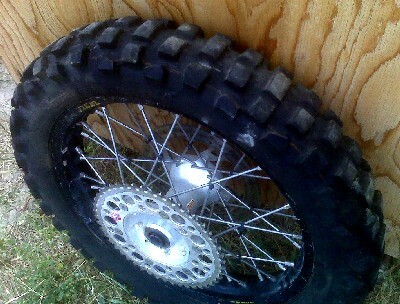 The D606 is a street legal tire that offers great durability for a relatively aggressive knobby. The tread pattern and sidewall stiffness are similar to the excellent D739 A/T that we have been very happy with for serious desert/enduro riding. The problem with the 739 A/T is that at speed on hard surfaces (pavement and even some hard-packed dirt roads) knobs start to chunk off pretty quickly. Enter the D606 - essentially a 739 that is hard enough for even paved roads at very high speeds. This year we put well over 2000 blistering miles on several D606's. The D606 pictured above is fresh off a 31 hour blitz of the first 960 miles of the Tour of Idaho (a mixture of single track, ATV trail, dirt road and paved road). We ran it at around 16 psi. As you can see it is still reasonably good to go. Our experience with this tire suggests that it is, as advertised, versatile, durable, and capable of aggressive riding off-road.